Noah Syndergaard picked up his seventh win of the season on Wednesday night, striking out 11 Pirates batters over 8.1 innings. We’ve come to expect this sort of dominant stat line from the Mets’ 23-year-old ace this year, in large part because this season he’s unveiled a new pitch, a sort of hybrid slider-cutter called the Warthen slider. Syndergaard throws the Warthen slider — named after Mets’ pitching coach Dan Warthen — at somewhere between 92 and 95 mph, but the movement on the pitch makes it sometimes look something more like a power knuckle-curve. Syndergaard’s fastball regularly grazes 100 mph, and the slider is so fast, too, that batters must inevitably track it as a fastball as it roars toward the center of the plate. So Kratz swings, except the pitch is a slider, and the movement dips the ball down and away from the batter. How are you supposed to hit this? That he can throw it not only that hard, but that he can command it, I think, is most impressive. To be able to throw a 95-mph slider and not know where it’s going is not easy … But for him to be able to throw it as hard as he does and know where to put and to spot it up, I think, is most important. 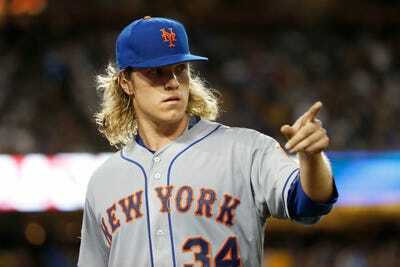 And remember — Syndergaard didn’t even throw it last year!